Xiaomi has developed a fast-charger that’s able to charge a smartphone with 100W of power. In a video posted on Weibo that was spotted by XDA-Developers, a 4,000mAh phone is shown charging from empty to 100 percent in 17 minutes. 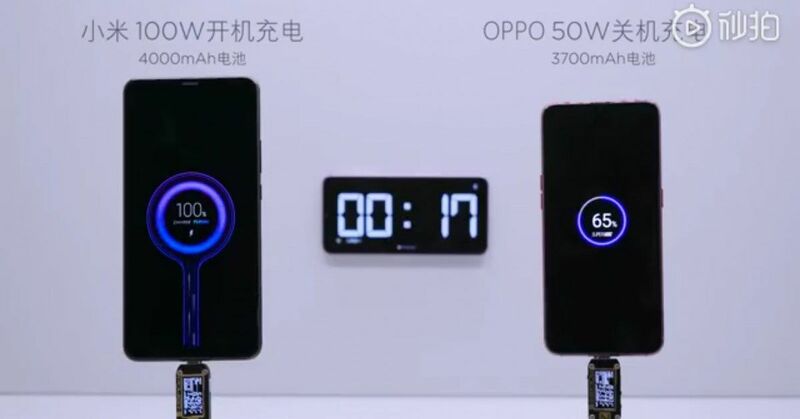 The fastest charger we’ve ever tested, Oppo’s 50W Super VOOC, is shown charging its 3,700mAh battery to 65 percent in the same amount of time. Although the Type-C connector already supports 100W of power draw, the bigger challenge with delivering this much power is getting it into a small battery without overloading it. Oppo’s Super VOOC achieves this in part by splitting its 3,400mAh battery into two separate 1,700mAh cells.